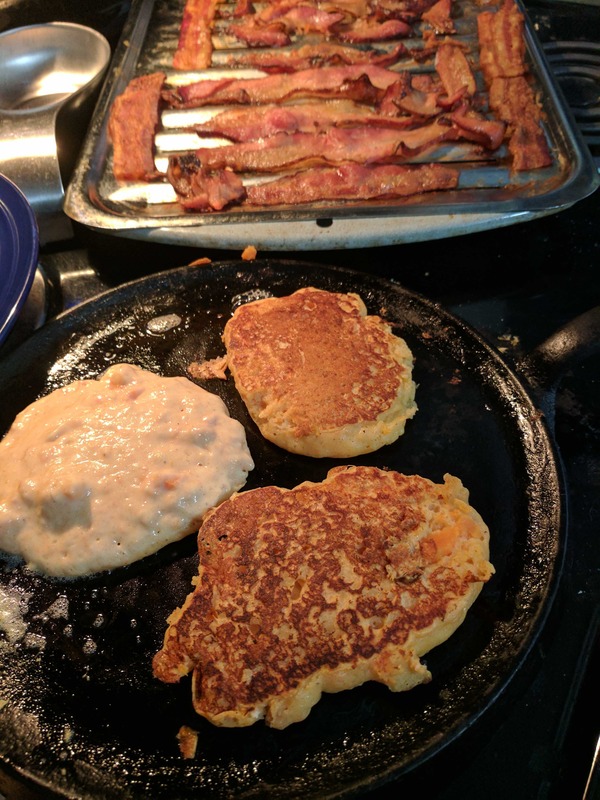 For breakfast this morning I made some sweet potato pancakes. They were sweet enough to need only a splash of maple syrup and they went really well with some salty, smokey bacon. To get the sweet potato mash, Michelle fills a crock pot with rinsed sweet potatoes and puts them on low overnight (6 to 8 hours). Don’t pierce them or anything or you’ll get a mess in the bottom of your crock pot! The next day, use a spoon to take the peel off. After mashing them, she stores them in 2 cup servings in zip top bags in the freezer. Perfect for making a side dish for dinner or adding into crescent roll or biscuit dough or, like here, in pancakes. I didn’t have any buttermilk, so I used a combination of Greek yogurt and milk. You could also use sour cream in place of the Greek yogurt. If you have buttermilk, use 1 1/2 cup in place of the milk and Greek yogurt/sour cream. Place sweet potatoes, Greek yogurt, milk and egg in a medium bowl. Melt 2 tablespoons butter and add to the mixture. Whisk to combine. Stir together flour, baking powder, baking soda, salt, nutmeg, and cinnamon in a large bowl and whisk to combine. Add wet ingredients to dry and stir until mixed. Do not overmix and, for best results, let the batter stand while you heat griddle and preheat oven to 200 degrees F.
Melt 1/2 tablespoon butter in a griddle over medium heat. Add batter by 1/4-cup measures. Cook until the first side is golden brown, about 2 minutes. Carefully flip and cook until browned on second side and pancakes are puffed, about 2 minutes longer. Transfer to a plate and set in the warm oven and repeat until all pancakes are cooked, adding more butter to the griddle as necessary. Serve immediately with a little maple syrup.